The Complete Martial Artist. Sensei Mal McRae’s ki fusion Aikido. Home › Articles › The Complete Martial Artist. Sensei Mal McRae’s ki fusion Aikido. Why are there many different styles of Aikido today? Professor Morihei Ueshiba is credited with paving the way in what is considered as today’s modern Aikido. All the various styles have their roots seeded in the Aikido that he originated. Nothing stays the Status Quo. Change is inevitable. If Ueshiba was with us today I believe he would be incredibly moved to see the expression of his creation, Aikido, studied through many numerous and innovative styles. This is what keeps Aikido alive. What can ruin any organisation is its internal politics. The seeds of jealousy, possessiveness and fears over leadership can take root, just to mention a few. Breakaway groups in general may have seen themselves as being controlled or they may want to pursue a particular direction that others may not have in their vision statement. What generally happens, people move on to create their own style. There were factions when Ueshiba was alive and there will be factions of those factions in the future. As I see it, Ueshiba’s vision was to show mankind how connected we really are, through his conception of Aikido. Sadly, we seem more focused on our differences rather than our similarities. Realistically this may not be possible on a large scale due to opposing views that may occur if we were all under the same Aikido style. These styles represent personalities within an Aikido framework. Diverse styles attract a wider student appeal. Aikido’s large following today is because of this diversity. I regard this as a positive. What part does ki play in Aikido? For me ki is the most important component yet often the least understood. It represents the middle of the three Chinese characters (kanji) that make up the word Ai-ki-do. It’s a collective of all three, or it would read as ‘Ai-do’. Ueshiba put great emphasis on the importance of ki, especially in his latter life. Pre-war: Aikido was in its development. Ueshiba was known for his exceptional physical strength back then. Technique may have been more predominant over the emphasis of ki at that time. Post war: Ueshiba realised his physical strength and dependence on technical form was in decline. To stay the phenomenal martial artist that he was, he must have realised this and cultivated an incredible ki understanding that was very rare and unseen for those days. The techniques performed in Aikido are designed to express our natural ability to move. They shouldn’t feel forced. Through a type of relaxation, we learn to project ki beyond the limitations of bodily structure. Through this understanding, which has been sewn into the technical forms left to us by the founder, ki separates from our physical, leading the attacker’s intention by fusing both intentional spirits together. Why is the ki component so hard to master? Ki itself is formless. To comprehend ki within Aikido can require a complete overhaul of our current thinking. Ki is a complete opposite to anything we can grasp physically. It has no colour, weight odour or form. Structurally the body has all of these things. Ki also appears not to want to conform to the laws of physics. To understand the release of ki will undoubtedly take additional mastery. This road is less traveled due to main stream marketing to create a business like industry. The short term training approach to martial arts can seem appealing and can be socially accepted as trendy. In today’s ‘learn by course approach’ martial arts tend to be hacked to fulfil a growing market to learn only what seems necessary for one’s self protection. To most the term ki isn’t known or doesn’t even exist? Sadly this untapped potential of ones ki may not be fully explored while training within these parameters. Believing one’s training to be complete may give a false sense of skill achievement gained through this form of packaging. Martial art mastery requires years of dedicated commitment that can only be fully appreciated through ongoing development and continuity within the training. This prevents a naive view of self-defence that could lead the student to withdraw early from martial art training. The learning of kata within a large group can provide steady progression. But ki seeks out true individuality rather than forms learnt through collective mechanical repetition. This method may be great to build a school. However the personal instruction necessary to cultivate ki is missing. Ki is transmitted from person to person in a way designed by the founder, through the application of locks, holds and ukemi within the Aikido technique itself. To acquire real martial artistry with ki, a relaxed natural body style is required so that ki flows around and out of the body unrestricted. There is ki with forced rigidity which is more common and then there is soft ki. Soft ki really has no form and is therefore extremely hard to copy because of this. Also ki at this level requires far less physical presence. This is why Ueshiba still had such devastating ability up to his passing, aged eighty-six. As well a general requirement throughout Aikido is a role reversal of attacker and defender both at the same time. This is an essential teaching tool required to help with the appreciation of numerous things, including humility and gaining a unique perspective of the training environment seen through eyes of partners, not opponents. This can seem quite unusual within the martial arts where competition can seem prevalent. In a way this is why Aikido can look contrived and unrealistic to some. This was unique for a martial art in those times. Ueshiba with his enlightened understanding implemented a holistic, intellectual concept into his martial art; something missing in all other combative arts back then. This transcended his understanding of Aiki-jitsu to create Aikido as a do form. No I don’t believe we can develop ki. This is because ki already exists. The universe was created with ki. We are all born of it and with it. When we pass it returns back to the universal source. Having said that, we can learn to cultivate and release it from our body, through the process of the kokyu breath technique. It is often said we can develop ki. This is a miss-interpretation. The same can be said stating “I will develop the wheel”. We know the wheel already exists. Most people go through life not utilising the full potential of their ki. I suppose what you know little or nothing about is not usually missed. A vehicle like Aikido will help release this internal energy so it can be also used outside the martial arts. A shared idea from David Brown Sensei, my instructor, was to separate the mind and body while attacking or being attacked. Through a desire to understand Aikido better, I use this principle extensively to form the bases in which I study my Aikido. Mind and body should be together while engaging in general daily activities. If you are ever unlucky enough to be attacked you must project your mind from your body in an instant, so the mind stays calm and it can more easily communicate to the body how it should move correctly. This is similar to people who hang by one arm from high structures with no safety line. Fear can be controlled or in their case totally switched off. If they cloud their mind with panic, imagining that they will fall to their death, the mind and body become one. They stop thinking clearly. Panic takes precedent and they tense up, with catastrophic results. This shift in mindset could cause them to fall, whereas if they were two meters off the ground, they would find this simple task child’s play. I am sure the samurai of centuries ago had a similar mindset, to be able to stay calm while staring down a swordsman in the face of death. Ueshiba spoke of protecting the attacker. What do you think he meant by this? This is the quandary. Why would we want to care for our attacker, right? There are martial arts that rely on aggression as a weapon of choice. Aggression attracts aggression, so too, harmony attracts calm. If only to portray a selfish, destructive mindset, martial arts eventually will lead everyone to harm. To pursue countless ways to inflict eruptible damage through mainly kicking and punching as hard as possible is far too often misunderstood and seen as an ultimate way to control. Unfortunately, even the most extremely skilled martial artist can end up accountable for inflicting major injuries and sometimes death within the confrontation. Immobilization skills may only exist through the result of the damage received from a hit or after falling on a hard surface and becoming concussed or comatose. For some, victory at any cost can seem the ultimate objective. The ego takes over, and a justification for the self is accepted. The goal I believe in Ueshiba’s Aikido is self-protection fused with a care for the attacker. Otherwise, to destroy the enemy becomes the destruction of oneself. The choice is ours. I feel to strive for this as our moral and ethical code is concreted within the principles of Aikido. This conception to an idea is not to have an arrogance to permanently injure the attacker. This could still occur within an Aikido confrontation, but the underlying attitude gained through ai-ki concepts teaches a sincere respect for all living things through a universal principle. Why are there techniques from a kneeling position and what benefits do they have? Aikido originates from Japan where kneeling in Ueshiba’s time was cultural. Ueshiba added “suwari waza” kneeling technique as a way of developing a powerful flexible centre which can aid your stability if attacked. Why did you choose Aikido? I didn’t choose Aikido. It chose me. My father was in the jewellery trade as a clock and watchmaker. I wanted greatly to follow in his footsteps and have him apprentice me. Sadly this was not to be due to his passing when I was quite young. Not long after I met David Brown and my journey started in this trade as his apprentice. This is also when I began martial arts. David was to become my Aikido teacher and mentor over the next 25 or so years. Even though we rarely train together nowadays, I shall always regard David as my instructor and close friend. He opened my eyes to the full potential of Aikido. I consider David one of the most inspirational and innovative teachers to have ever learned from. 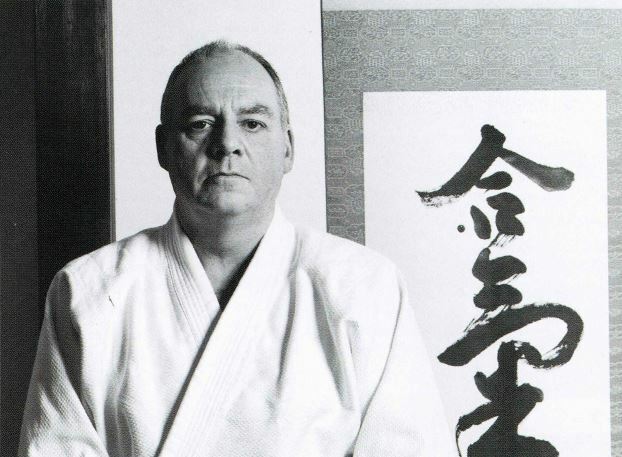 ‘There is so much more to Aikido than just self-defence!’ I regard this as his most important lesson taught because David passed down an extremely high understanding of the spirit of Aikido and I am deeply grateful. Now as I look back I feel our paths were meant to cross. I wasn’t looking for a martial art at that time; I believe it was looking for me. It was just the right place at the right time. This is why I say Aikido chose me. 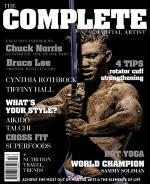 What do you think makes a complete martial artist? To be complete, therein ends the search. Philosophically, martial arts go far deeper than for money, competition, trophies for ego, or secret technique. I view these as mere diversions and not the real reflection. Broken down, there is the martial and there is the art. We really shouldn’t have one without the other. They are inseparable. Together they form a canvas. Painting the complete martial artist becomes our own personal journey, shaping the spirit as we explore within empty space…. (c)copyright-Mal McRae Sensei. The Complete Martial Artist-2014.